When our kids came along, there was no way we were going to bring that stuff into our house. That idea worked for a lot of years…until our teenaged kids started going to their friend’s houses and they were introduced to the irresistible flavor packet in ramen. I decided to take on the toxic ramen spice packet, I was determined to create something that tasted so good, that even the friends couldn’t tell the difference. 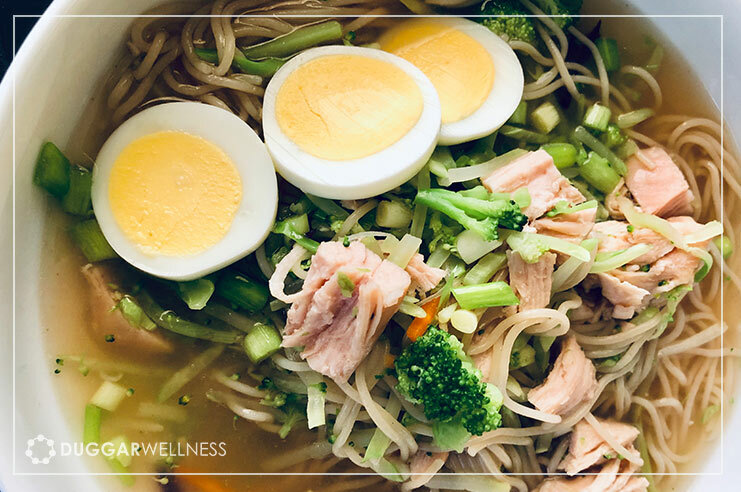 If you’re in the mood for some good, real food ramen give this recipe a try. Place the broth, water, and Liquid Aminos into a medium sauce pan. Bring to a boil and stir in the salt, garlic, ginger, and green onions. Add the noodles and cook according to package directions- about 3 minutes. Divide noodles and broth into 4 bowls, top with any optional ingredients listed above and enjoy!